Indigenous/Tribal community: Chinook, Straits, Hul’qumi’num, Squamish, Sechelt, Comox, Lummi, Lushootseed, Nuu-chah-nulth, Kwakwaka’wakw, Ktunaxa, Sisika, Selish, Nez Perce and Great Basin. Many traditional First Nations languages had words for this local food, but the Chinook names, camas or lecamas, came to be the most popularly used. Camas bulbs may come from two related species of lily, Camassia quamash and Camassia leichtlinii. 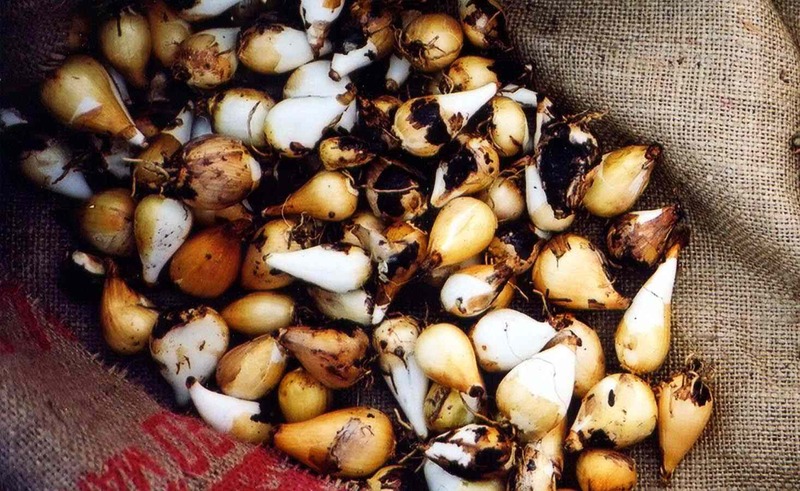 Until the 20th century, camas bulbs were an important part of the diet of indigenous peoples in the area, and the second most traded item, after salmon. When the bulbs are cooked slowly over time, their major carbohydrate, which is a largely indigestible complex sugar, breaks down into fructose, a sweet and digestible sugar. Camas plants have grass-like leaves, with flowers varying from dark to light blue or occasionally white. The edible bulb has a chestnut brown membrane with darker skin that is easily rubbed off. Care must be taken not to mistake the edible camas bulbs for the bulbs of the highly toxic Death Camas (Zigadenus venenosus), which has more compact, cream-colored flowers, and bulbs with a white membrane. Camas bulbs should be cooked and immediately consumed or dried for winter use or trade. Steaming the bulbs is the most common method, usually for over 24 hours and up to 70. Bulbs can also be boiled and mashed into a thin paste or roasted. The cooked camas have a sweet taste, and a flavor described as similar to a baked pear, prune or sweet chestnut. Dried flattened bulbs would historically be served with seal, whale or fish oil. Harvesting, preparing and consuming camas transmitted culture and knowledge between generations. Cooked camas were commonly served at First Nations’ celebrations until only a few decades ago, when the tradition of cultivating, harvesting and cooking were almost lost completely, as the bulbs were replaced by potatoes and other introduced root vegetables. The bulbs are still sold in gardening stores as ornamental flowers. Some individual harvest camas small amounts for consumption on special occasions, and some First Nations community gardens are starting to grow it. Camas bulbs are threatened by invasive species crowding growing grounds and the loss of cultural knowledge between generations. Camas is classified as a rare species and today wild harvest is discouraged and cultivation encouraged.